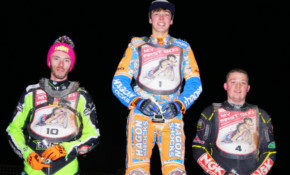 Isle of Wight's speedway septet were in action last night in the Vince Mapley Memorial Trophy. Sponsors and supporters are invited to watch the ‘Wightlink’ Warriors and Wizards go through their paces on their Press and Practice Day in April. Riding mainly in the Midland Development League to date, Connor will be embarking on his fifth season of racing and will be fulfilling his wish for National League action. Chad says the Warriors management have been brilliant and that "being offered a chance to go straight into the main team at reserve is a dream come true". Reigning National League Riders Champion Ben Morley has given Island speedway fans a massive pre-Christmas boost with news that he will be back to ride for the 'Wightlink' Warriors in 2019. This is the Warriors' fifth home league win of the season and moves them up to sixth place in the table. The Warriors' co-promoter Barry Bishop said it was a super speedway meeting full of good racing from everyone, spiced with a little controversy, but another disappointing home reversal. Apart from Ben Morley, who posted four wins in his 14 points haul plus the fastest time by a home rider this year, no other Island rider could take the chequered flag. Five falls or exclusions did not help the cause of the Warriors as they faced the Eastbourne Eagles in the first leg of their Knock Out Cup tie. With the Devils' top man in great form, Warriors came up short last night and will need to reflect on a couple of slight mistakes that may well have made the difference between this loss and a narrow win. This Thursday (12th) sees the return of Speedway to Smallbrook Stadium - the Wightlink Warriors team hope to get their 2018 season underway by entertaining League Champions, Belle Vue Colts. Turnstiles open at 5.30pm and the pits will be open for viewing from 5.45pm to 6.15pm, with the grand parade of riders taking place at 6.45pm and tapes up on the first race at 7pm.